PREPARE ravioli according to package directions. Drain and rinse quickly with cold water; drain again. 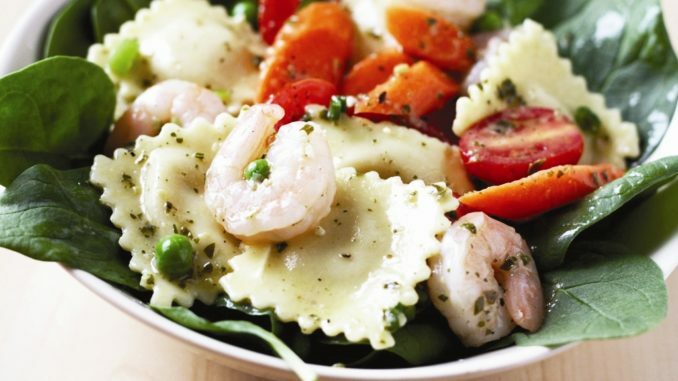 COMBINE ravioli, grape tomatoes, scallions, carrots, peas and shrimp in a bowl. WHISK together red wine vinegar, pesto and garlic. Slowly whisk in olive oil until dressing is emulsified. Pour vinaigrette over ravioli mixture. Cover; refrigerate for 30 minutes prior to serving. SERVE at room temperature over baby spinach leaves.